It was September 4, 2006, around 10:30pm and I was in our dining room writing an email to some dear friends of mine to request that in the next few weeks, they’d send emails or give calls to my mom. I knew it was going to be hard on her. From where I was sitting, I could hear her crying in my parents’ bedroom. I was leaving for Mexico the next day. Not just for a short trip. I was moving there. My heart broke for her. It was of course sad for me too, but I knew it was going to be hard on my mom (and my whole family too– but especially for her)– and that was harder for me than my own sadness of leaving. I finished my email and then spent some time with my mom comforting her and trying to make it easier. It was at that point that I began learning the lesson that the Lord will give you grace for whatever He has called you to. He did give me grace. I remember arriving in the Mexico City airport the next night. I was going through customs, getting ready to meet the training missionaries waiting for me. And I thought, Oh goodness, what have I done? I laugh now. But it was a big leap of faith for me! My family came to visit me 4 months after I moved to Mexico and I think that trip gave us all peace to move on. It never became “easy” to say goodbyes, but we learned how to process through the emotions of the hard times of being away. Anywho, where’s this coming from? Well, more than a year ago, I went for coffee with a good friend of mine. As we were walking there, she mentioned that counting the cost for moving overseas would be high for her, as she had a little one she was taking away from the grandparents. I agreed with her, imagining what it must be like, but honestly– not really understanding. I’ve been thinking a lot about that conversation the last few weeks. Because now I understand. Even now, having my little one be so far away from her grandparents is hard. And we’re only states away! We try to keep them involved, sending them pictures and videos of what’s going on, skyping to let them coo at her. I know that it’s difficult for them. The excitement of getting my little one’s passport in the mail is bittersweet for them. Again, the Lord will give grace for whatever He has called you to. For us, He will give us the grace to transition to a foreign land and patiently learn how to share His love with a people who do not speak our language. For my parents, I know He has a different type of grace for them to accept their dear ones being taken away. It’s a good thing the Holy Spirit is called the Comforter. When we were taking the Perspectives Course, during the History Section, I was continually amazed at the fervor and tenacity of the missionaries of two and three centuries ago. Man, they were the real deal. They left and didn’t come back. They didn’t have Skype. They didn’t have telephones or Priority Mail. They didn’t have hospitals or even translation dictionaries. They often packed their belongings in coffins they purchased. There was no turning back. They counted the cost. They caught the vision of a passionate, saving God who wanted His Rescue and Redemption broadcast to the very ends of the earth. They knew their Savior who was the Greatest Missionary ever, who sacrificed His life to give them life. And they knew it was all worth it. The pain of leaving home. The difficult journey. The hours of study to be able to communicate. Sickness. Loneliness. Death. They heard their Savior calling them from distant lands where He wanted His Kingdom to go. And they followed. Honestly, my plight doesn’t seem so terrible when I consider them. In fact, I usually feel like a wuss. The ache of only being able to see each other via Skype makes me thankful that we have the privilege and comfort to be able to see each other via Skype. But, nonetheless, I must consider: is it worth it? Do I have what it takes to finish the call? It’s unwise to just jump into it, like the parable Jesus told. We must consider– is it worth it? And if it is: am I willing? Well. If I want to be a disciple of Christ, then I must be willing to give up all. If I am to be His child, I must recognize that all is my Father’s anyhow. My call (and yours as well) as His follower is to be a disciple maker, and if I am to obey, then I must take my assignment sheet and find out where it is I am assigned. I really can’t be His disciple if I won’t obey Him in all. Our assignment happens to be in a different location than my parents’ and siblings’. For them, the cost (in this situation) is submitting to God’s will and releasing us with grace to be obedient to the Lord’s call. The wonderful thing though is that it’s not something we go about in our own strength. The Lord goes with us, gives us power, gives us grace. He sustains us, encourages us, pushes us further. And for whatever “sacrifice” we are called to make, He is always generous and gracious with us. So, after zig-zagging across the mountain a few times, it comes down to the fact that we must keep our eyes fixed on Jesus. He is so worth it all. It’s hard, yes. But if we love Jesus, we must obey Him. And when we obey Him, He is pleased. Those are my thoughts lately. The truth of it gives me peace, but it doesn’t take away the emotions. Still, I’m thankful for Skype. In 2000, I took my first mission trip with Teen Mania to India. Rewind about 6.5 months. I felt SOOO compelled that I had to go on a missions trip that summer (cool story, perhaps for another day). I had a catalog of the trips available through Teen Mania and I had spent about a week trying to get my mom to take a look at it. Finally, the moment had come and we were sitting in the living room and I was a bit nervous. That was all I needed to hear. I got her to sign the parental consent on the application, got my recommendations from people and sent it in. I spent the next month dreaming every night of what it would be like and was elated when I got my acceptance packet. I had from February till May to raise about $3000. God miraculously provided in unexpected ways. My whole family grew during the process and in June, my mom tearfully kissed me goodbye as she sent her little 15 year old off across the world. God did amazing things that summer. People got saved as we went out and evangelized. Crippled people walked, the blind and deaf were healed. I prayed for a little 6 year old boy who had never walked and after a prodding from the Holy Spirit, I prayed for him a second time and he walked. At that site, people now responded to the call to believe in Jesus. Fast forward 6 years later. I’m 21, it’s January 2 and I’m sitting in my pastor’s living room telling him I feel called to move to Mexico. He said– Janine, if you feel God is calling you to go, you need to obey Him. He later encouraged me in what were some next steps I needed to take. The most daunting part of the process for me was raising support. This time it wasn’t a “one-time amount” but monthly support. It was more of a commitment from people. It was a bit awkward for me now. I remember telling someone that I called it “draising”… because there was no fun in it. It was hard to ask for support, but “unfortunately” it was how I was going to be able to minister in Mexico and follow God where He was calling. -You don’t have to feel guilty about support raising. -Support raising is ultimately the Lord’s responsibility. There are people that He is calling to participate, to join their hearts in the vision. So, really, my responsibility is “vision casting”, not support raising. -Just because there are manipulative people out there doesn’t mean that support raising is manipulative. -Support raising means that you can give your time freely. -If you don’t have enough support, it can really affect you– your health, your longevity as a missionary, your ability to minister, the reputation you show for the Kingdom of God. Well, to begin with, smack my forehead at the thought of people sending support letters to people they don’t know. Please don’t ever do that! But beyond that… there was a lot of subjects that seemed to come up in this post and the following comments. Those weren’t all the comments, by the way. I, of course commented too, but that’ll be for another day. First, I thought– gee, a lot of people seem to have these thoughts! All of a sudden, I felt really vulnerable. Wow, is this the impression people have of me?? Honestly, I was a bit hurt. Not offended, but hurt. But I also realized that this post provided a great opportunity. More on that later. No one likes generalizations. While I have heard stories of unfaithful missionaries, there are countless others I know personally who gave up great jobs to go on the field, who lived a minimalistic lifestyle, who suffered lack on the field…yet who were faithful. While a missionary should absolutely live simplistically, I’d like to add: so should the person at home. I know personally, I used to have the idea that missionaries live dirt poor lifestyles, and that’s just the way that it is. But I think it has become synonymous that missions means poverty. So with that mindset, the idea of a missionary looking stylish seems wrong. The idea of a missionary with an iPhone seems shameful. 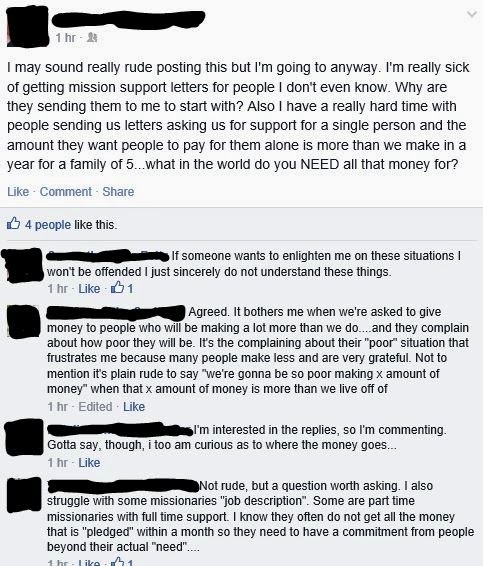 The idea of a missionary providing something nice for their child seems wrong…. Right. Before we judge others, we may want to take a look at our own lifestyles and see if it reflects a lifestyle that is advancing the kingdom of God (and there are many of those here in America who are living that lifestyle, I just wanna say). We shouldn’t hold others to a lifestyle that we ourselves aren’t willing to live with. But I’ll not touch this subject any further for the time being. In later blogs (because this has brought up a LOT of conversation between my husband and I), I will share personal testimonies of being on the field with lack, my own struggle with the idea of support raising, and things I learned on the field from missionaries. We also realized that usually, people don’t realize the costs that go into being on the field– things you don’t even think of– like self-employment tax. Did you know that to be a missionary, you usually have to pay self-employment tax? Mine came out to about $800 a year. Anyway, we felt it was important for people to see the breakdown of budgets, as originally commented on in the initial post. So, we want people to have access to our budget– and if you have questions about it, you can feel free to ask. Because what seems perhaps like an unnecessary expense to you may in fact be necessary on the field. So, if you want to see it, please email us or meet with us. We’d love to dialogue. There are many more blogs coming and perhaps even a video blog from my husband, as he has his own story to share. So stay tuned!